While on vacation recently, I had just returned from a morning run. A family member complimented me, saying that she had never been able to enjoy running. I explained that I actually don’t like running either, which shocked her. Why would I do an exercise I don’t like? I agree with the experts on the podcast: the best exercise is the one you like to do. But what if there isn’t an exercise I like? Or what if I don’t have access to or the resources for the exercise I like? For me personally, I love playing volleyball and would love to do that for my exercise. However, that requires quite a bit of equipment and several other people, so it isn’t feasible for my daily routine. Most “traditional” forms of exercise I’ve tried – running, biking, a treadmill, elliptical – I really do not enjoy. To be honest, I just don’t enjoy exercising. BUT I do enjoy how I feel after exercising. I feel better, more alert, and like I have accomplished something. I exercise first thing in the morning, and it gives me a positive start to my day. So if you are like me and struggle to find an exercise you actually like, try finding other motivation for doing it. Here are some tips. -Workout with a friend or loved one to also enjoy some quality time or conversation. Fat-burning aerobic exercise requires oxygen, so you should still be able to talk during your workout. 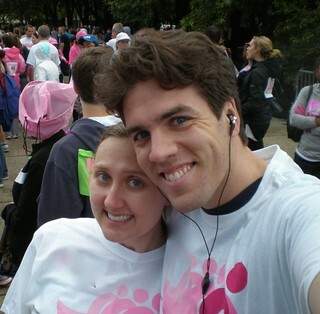 I don’t enjoy running, but running with my husband is less miserable. -Focus on the energy or sense of accomplishment you feel after a workout. Even though I’m tired after a workout, it wakes me up in the morning and gets me ready to tackle my day. -Listen to music, podcasts, or audiobooks or watch a TV show you love to distract yourself from what you are doing. Upbeat music can help you keep your pace up. I really enjoy listening to audiobooks right now, since the characters can distract me from how much longer I need to workout. Remember, you may not love the exercise itself, but you can love what surrounds it. Also, try out different forms of exercise. You may not like any of them, but you may find one that you dislike less than the others. I don’t enjoy yoga or riding a bike, but I don’t hate “running” on an elliptical or doing pilates. And preferences can change over time. I really liked running in graduate school to relieve stress, but now I find it very monotonous. Any suggestions on what you have found helpful for exercising? Share in the comments.